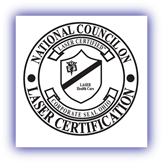 Copyright © 2015 by "National Council on Laser Certification"
The NCLC itself does not offer training but our parent non-profit training organization and affiliates do. We would recommend that if you need initial training to qualify to take the NCLC exams that you utilize these groups (see affiliates & training at the left). Proctors with these groups are also authorized to administer the NCLC exams to qualified individuals at the end of their training courses which makes testing very convenient for the student, and you benefit from the intensive review session provided prior to examination. See the CLSO/M for that Certification. The Dubai Health Authority (DHA) has approved the NCLC Aesthetic Laser Operator Certifications for licensing of practitioners in the United Arab Emirates including physicians. The State of Texas has been accepting NCLC Certification as part of their licensing process.